Our third season of First Fridays kicked off with a special “On the Road” edition focusing on the food worker shortage in Fargo-Moorhead, our region, and beyond. Check out our Food of the North blog for a complete listing of community announcements. The final First Fridays at B of the 2018 season focused on the stories of chefs in our community. We welcomed Andrea Baumgardner of BernBaum's, Patricia Hanson Vetter of Prairie St John's, and Travis Rosenbluth of Harvestable to the stage to share their perspectives on what it’s like to be a full-time chef in Fargo-Moorhead. The January edition of the FM Sustainability Network meet-up will be held Monday, Jan. 14 at Front Street Taproom from 5:30-7 p.m. Event to feature Jennifer Toso-Kenna, the state director of the Miss North Dakota and Minnesota Earth pageants, as well as the president and owner of the Sustainable Beauty Foundation, a 501(c)3 non profit organization. The Northern Plains Sustainable Agriculture Society to host their 2019 conference January 24-26, 2019. Keynote speakers include Dan Barber from Stone Barn Center and Steffen & Rachel Schneider from Hawthorne Valley Farm. In addition to the conference, Northern Plains Sustainable Agriculture Society is partnering with the Cass Clay Food Partners, Ugly Food of the North, and the North Dakota Culinary Institute Project to host a screening of the film “Wasted! The Story of Food Waste” on Sunday, Jan. 13 from 2-4 p.m.
Longspur Prairie Fund is sponsoring a new farm-to-table initiative in conjunction with a small coffee producer in Costa Rica. All proceeds benefit High Plains conservation. Learn more about Longspur Prairie Fund, and stay informed via Facebook. Celebrate the holidays with Growing Together ~ A Community Garden Ministry at their annual Christmas Party at Olivet Lutheran Church on December 13th at 5 p.m.
Stay tuned to Facebook for more details. Interested in learning how local farmers are meeting the challenges of changing climates? Mark your calendar for the “Farming for the Future Farmers Panel” on February 6 at 6:30 p.m. at Barry Auditorium in the Offutt School of Business (Concordia College). New group formed to connect F-M residents interested in urban agriculture, specifically Moorhead residents who are interesting in getting a backyard chickens ordinance passed. The Great Plains Food Bank is hiring! The Santaland Diaries by David Sedaris (Adapted by Joe Mantello) is happening NOW! The next Theatre B show, "Marjorie Prime" opens on February 8th. Get details + buy tickets here. Special thanks to our friends at Tellwell for being our official greeters, and to Thunder Coffee for the delicious brews. Mark your calendars for the FIRST First Fridays of 2019 on Feb. 1, and stay tuned to social for more details. Want to ensure First Fridays continues? Help us fund the upcoming season by donating to First Fridays at B via the FM Area Caring Catalog, NOW through Dec. 31, 2018. Our organization, Ugly Food of the North, was founded on educating our local community about the global problem of food waste. In the United States, it is estimated that 40% of food resources go to waste each year, resulting in an economic loss of over $165 billion a year. While thousands of fresh, healthy local food go to waste, 11.8% of Americans households were food insecure in 2017. In Fargo-Moorhead, local organizations are stepping up to solve this problem by rescuing food that might have been wasted, and using it to feed the hungry. In the last growing season, a total of 21,094 pounds of locally grown fruits and vegetables was rescued and donated to charitable feeding organizations through Cass and Clay counties in 2018. This amount of food represents 17,578 meals for individuals and families in need. About: Started in 2016 by the NDSU Extension Master Gardeners, Veggies for the Pantry works to rescue excess garden produce and donate it to area food pantries. Master Gardener volunteers set-up produce drop-off locations across Fargo-Moorhead-West Fargo and individuals can drop off their excess garden produce on Monday evenings throughout the growing season. Master Gardener volunteers collect the excess produce and deliver it to area food pantries. About: Growing Together is a program jointly sponsored by Fargo First United Methodist Church and Olivet Lutheran Church in Fargo. Growing Together manages six community garden locations across Fargo-Moorhead with over 200 volunteers. For over ten years, the families, primarily new Americans, come together each week and work in the community gardens. About: GleaND is a volunteer powered network organized by the Great Plains Food Bank, NDSU Extension & Fargo Cass Public Health. The purpose of GleaND is to capture excess produce from local growers and channel it through charitable feeding networks. 2018 marked the pilot season. The organization worked with 4 local growers and hosted 6 gleans with the help of 19 volunteers. About: The Red River Market is Fargo-Moorhead’s largest farmers market located in Downtown Fargo every Saturday July through October. The Market is committed to increasing access to sustainably grown, local food and food products in the Fargo-Moorhead metro-area and beyond. Produce vendors can donate their unsold fruits and vegetables at the close of each Market and the food is donated to area food pantries by Master Gardener volunteers. Note: These numbers do not represent food donated directly to area food pantries by individuals. To get involved with food rescue, watch our Facebook page for volunteer opportunities, and follow Veggies for the Pantry, Growing Together, GleaND, and the Red River Market. Heart-n-Soul Community Cafe is a pop-up community cafe with pay what you can afford pricing. The next meal is a Soup & Salad Supper on Wednesday, Oct. 10 from 5-7 p.m. at the Red Silo. Learn more + RSVP via Facebook event. The F-M Sustainability Network is hosting a screening of the documentary Living in Future’s Past on Tuesday, Oct. 9 at 7:30 p.m. at Marcus West Acres 14 Cinema. The film takes a look under the hood of humanity, beyond politics, borders, and boundaries for a raw glimpse at the daunting environmental and humanitarian challenges we face. Tickets are $12. Link to Facebook event. October is a busy month at Prairie Roots. Not only is it CO-OP month, but it's also BULK food month. Each week they are offering 20% OFF popular bulk products and from October 4-10, it's 20% off bulk rice, grain and beans. They also have a great selection of Doubting Thomas wild mushrooms. More details via Facebook. Prairie Roots Community Fund is the non-profit arm of Prairie Roots Food Co-op, dedicated to building a healthy community by providing access to natural, organic, and local food. They are doing work in the Madison Neighborhood of Fargo to establish a new community garden and provide nutrition and wellness programs. They also have a SNAP Double Bucks program. Learn more + connect via Facebook. Wild Terra is hosting Apple Harvest Festival on Saturday, October 13 from 12-7 p.m.. This festival is a celebration of the apple harvest season! Wild Terra will have their apple press out and attendees can participate in making fresh pressed cider. The festival also includes food, games, friendly competitions, live music, art and more. Learn more + RSVP via Facebook. GleaND wrapped up a successful 2018 pilot season, hosting six gleans in the region and rescuing over 7,000 lbs of produce. The gleaned produce was donated to the Great Plains Food Bank and F-M area food pantries. Thanks to everyone who volunteered + growers who donated. Watch Facebook for upcoming announcements and sign-up to be a volunteer to hear about opportunities to glean in 2019. The University of Minnesota Extension has a brand new funding / learning opportunity called the Action Learning Seed Fund, a grant-making process that emphasizes the power of flexible funding and idea-centered investing. Learn more on the UM Extension website and contact Noelle Harden (harde073@umn.edu) if you’re interested in learning more. The September F-M Sustainability Network Gathering is Monday, Sept. 10 from 5:30-7 p.m. at Front Street Taproom. Get all of your questions answered about waste management from Fargo & Moorhead’s Recycling Coordinators, as well as The Clay County Solid Waste Outreach Educator. Open to all. RSVP via Facebook. Meet the New Prairie Roots General Manager, Trae Long on Thursday, Sept. 13 from 5-7 p.m. at the Co-op. Other updates from the co-op include a newly installed water dispenser machine, a Double Up Food Bucks program, and as always, great local produce. Stop by! RSVP via Facebook. The Welcoming Week Community Meal is Thursday, Sept. 13 from 5-8 p.m. at the Plains Art Museum. Come celebrate diversity with food! Community Table was designed for people to come together over shared recipes and a meal and give the oppotunity to meet a new friend, discover a new culture, and just share what makes the FM area great and prosperous! Free and open to all but RSVP requested via Eventbrite. Prairie Roots Community Fund is the new non-profit arm of Prairie Roots Food Co-op, dedicated to building a healthy community by providing access to natural, organic, and local food. The Community Fund carries out the social justice outreach committed to by Prairie Roots Food Co-op. Jen, Barbara & NiKaela are the newly hired Americorp Vistas. Learn more on Facebook. - Paella at the Red River Market on Saturday, Sept. 15 from 10-2 p.m.
- Paella at the Moorhead Farmers Market on Tuesday, Sept. 18 from 3:30-6:30 p.m. The University of Minnesota Extension has a brand new funding / learning opportunity called the Action Learning Seed Fund, a grant-making process that emphasizes the power of flexible funding and idea-centered investing. Learn more on the UM Extension website. 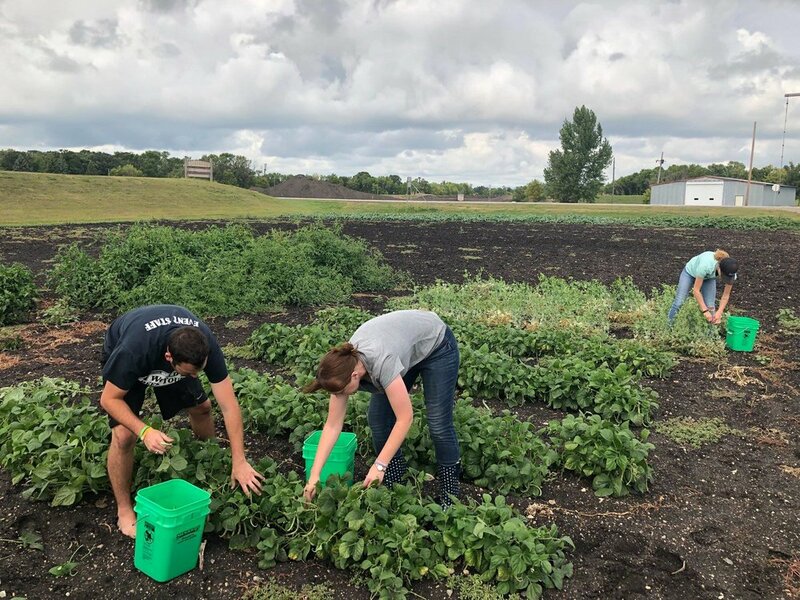 Growing Together, NDSU Extension, and several community groups have joined forces to host a series of Field to Fork Festivals at the Growing Together Community Gardens. The final festival of the season is Squash Fest on Tuesday, Oct. 2 from 4-7 p.m. at the Growing Together Garden (25th St & 40th Ave S., Fargo). Watch the NDSU Extension - Cass County Facebook page for more details. The next Cass Clay Food Commission meeting is Wednesday, Sept. 12 from 10:30 - 12 p.m. at Fargo City Hall (Commission Chambers). The focus of this meeting is food waste in Fargo-Moorhead. Opportunity for public input welcome. Learn more + RSVP via Facebook. GleaND is a volunteer-powered network serving North Dakota and Clay County, Minnesota. The goal is to capture excess produce from local growers and channel it through the charitable feeding networks we serve. Two gleans have happened this summer and the next glean is Tuesday, Sept. 11 at 6:30 p.m. in Halstad, Minn. Learn more + sign-up on the GleaND website. Our fifth First Fridays at B featured Leola Daul, Kayla Pridmore and Deb Kluck of Heart-n-Soul Community Café. Miss the event? Check out the video! Launching a new marketplace system called Harvestable that allows local farmers to connect with local restaurants. Join FM Sustainability mailing list by sending a message to fmsustainability@gmail.com. GleaND is a volunteer-powered food recovery network serving North Dakota and Clay County, Minnesota. Its goal is to capture excess produce from local growers and channel it through the charitable feeding networks we serve. Moorhead Farmers Market is now accepting vendors and working with First Presbyterian Church to accept SNAP benefits and Double Bucks up to $10 through Hunger Solutions Minnesota. Questions? Contact Kim at 218.299.5296 or by e-mail at kim.wangler@cityofmoorhead.com. Fargo Parks is implementing healthier snacks at pool, golf course and baseball park concession stands. Check them out! They now accept credit cards at all concession locations. Prairie Roots implemented a Double SNAP program. If SNAP recipients spend $10 at Prairie Roots they receive a $10 voucher to buy fruits and vegetables at a future purchase. Prairie Roots also host Sunday Brunch and will be offering meal kits later this month! Stay connected and get all the details on upcoming events via Facebook. Bjorn's a board member for the Dakota Resource Council on the Ag and Local Food Task Force. They're working on some projects in Buffalo and Devils Lake right now, but watch for future work in the F-M area. Bjorn's also purchasing Hugh's Gardens and offering a CSA. Contact him if you're interested in being a member. SFA - Lake Agassiz Chapter is hosting a number of events this summer. The next International Potluck is Thursday, May 24 at Plains Art Museum in partnership with Daughter's of the Earth. It will be a celebration of Native American culture. June potluck will be in combination with Lutheran Social Services for International Refugee Day, and July will be a collaboration with TEDx Fargo. Join the Facebook group to stay connected. The next Food Commission meeting is Wednesday, May 9, 10:30 a.m. at Fargo City Hall Commission Chambers. They're discussing federal nutrition programs at farmers markets and the update to the Metropolitan Food Systems Plan. RSVP for the meeting here and stay connected via Facebook. Did you know coffee grounds make great compost? Thunder Coffee is looking to partner with a local farmer to give their coffee grounds. Send them a message via Facebook or Instagram. The Moor's is on stage right now through May 12. Check out their box office to purchase tickets. Our Fargo-Moorhead community is home to six stellar farmers markets and they’re all accepting applications for new vendors for the upcoming season! Items sold at farmers markets can vary widely and typically include things like fresh produce, meats, eggs, baked goods, jams and jellies, hot foods, coffee, craft goods, and household items. If you’ve thought about selling at a farmers market before, check out the 2018 markets opportunities below and contact their managers for more info. Thursdays | July 5 - September 27 | 3-7 p.m.
Tuesdays | July 12-August 30 from 3-7 pm | September 6-27 from 3-6 pm. Saturdays | July 14 - October 27 | 10 a.m. - 2 p.m.
- Daily participation fee in the market is $25. This fee is payable to Northern Plains Botanic Garden Society, Vendors may also choose to pay $1,350 in advance for the 18 week season. Location: Rustad Recreation Center Parking Lot (601 26th Ave E, West Fargo) **NOTE New Location! Our third First Fridays at B featured Yoke-Sim Gunaratne of Cultural Diversity Resources and Peter Schott of the International Potluck. Missed the event? Check out the video! The Cass County Soil Conservation District has partnered with the United Prairie Foundation to create the Prairie Plant. Using all native grass and forb species, the Prairie Planter offers a tallgrass prairie in a pot. The planter provides the beauty of the prairie on your doorstep as well as a habitat for pollinators. FM Sustainability Network to host a meet-up Monday, March 12 at 6:30 p.m., at Front Street Taproom. Paul Jensen with present on opportunities for funding NOx reducing technologies made possible by the North Dakota Department of Health, Air Quality Division. RSVP to event on Facebook and join the mailing list by sending a message to fmsustainability@gmail.com. GleaND is a gleaning network that was developed out of a blueprint from Cass Clay Food Partners. This year, we will be working with a few local growers to capture excess produce to donate to local food pantries. There will be many volunteer opportunities during this growing season, and we will have more information as the program continues to develop. Want more information? Contact Janice via email at janicetweet@gmail.com. The portable garden project promotes healthy food for families. The project is a self-managed/self-directed sustainable agriculture and food logistics model. It will help build nutritional awareness and education. It is a home gardening awareness, healthy food choices, and vibrant community project. Children are able to learn where the different types of food they eat come from and how to grow them. To learn more + get involved, follow the recently created Facebook page for updates. Sign-up date for the Probstfield Organic Community Garden are April 8-9. Learn more about garden plots and RSVP to the Facebook event. FARRMS will be hosting a series of training events on March 27th and April 7th. The Northern Plains Botanic Garden Society is exploring possibilities of adding an edible orchard to the grounds in North Fargo. Over the next few months, NPBGS is looking for individuals to assist with planning and implementing the garden. If you or your affiliated group have an interest in local food production, food/plant education, landscaping or gardening, join the conversation on Facebook. Join Heart-n-Soul for a delicious supper at Cass Public Health on Monday, March 19 from 5-7 p.m. Supper will be prepared by Chef Chris Olson. Pay-what-you-can-afford pricing. All ages are welcome. Join Growing Together on March 15 to sign-up and learn more about the community gardens. Event will be held at Olivet Lutheran Church (1330 University Drive in Fargo). Arrive at 5 p.m., meal at 5:30 p.m. and event at 6:30 p.m.
NDSU Public Health to host “Health Equity and Social Justice: Bridging the Gap summit” on April 10 from 8 a.m. to 5 p.m. at NDSU Harry D. McGovern Alumni Center. Want to submit an announcement for our next First Fridays at B on Friday, April 6? Read the guidelines then submit an announcement here. Our second First Fridays at B featured Kaye, Abby and Joleen of Prairie Roots Food Co-op. Missed the event? Check out the video! The 2018 Cass County Community Garden Grants are open, $500 grants are available to enhance current gardens or to install new gardens. - Free “Field to Fork” Webinars offered by NDSU Extension Services start February 14. Learn more and register here. - The North Dakota Junior Master Gardener Grant Funds are available. Up to $1,000 available to North Dakota for youth education gardens. Application here. - Funds available in Minnesota through the Northwest Regional Sustainable Development Partnership. Fund projects related to local food and sustainable agriculture. -The University of Minnesota Extension is offering a series of free online courses for gardeners and farmers interested in community-based food systems. Learn more and register here. Great Plains Food Bank is conducting a Hunger Study in North Dakota and Clay County, Minnesota. They need volunteers to assist in conducting 500 face-to-face interviews. The Cass Clay Food Commission, our local food policy council passed a blueprint (jurisdictional advisory document) related to Healthy Corner Store Initiatives at their January meeting. You can read the blueprint here. The next Commission meeting is Wednesday, March 14, 10:30 a.m. at Fargo City Hall, Commission Chambers. Want to submit an announcement for our next First Fridays at B on Friday, March 2? Read the guidelines then submit an announcement here. An Urban Orchard is a fruit orchard located on a privately owned residential property, designed to be shared with the community. Follow these 10 steps to prepare, plant and maintain your Urban Orchard. Join Ugly Food of the North on Monday, Feb. 20 for a special community potluck featuring Jonathan Bloom, author of American Wasteland and a prominent national voice in the end-food-waste movement. On Monday, Jan. 9, Ugly Food of the North joined the F-M Sustainability Network to kick off 2017 at a meet-up featuring other organizations working on sustainability-related issues in our community. The Waffle Room co-founder's Simone Wai shares thoughts on sustainability, sucky pancakes and smoked salmon.